Covers losing positions by identifying and closing winning positions. This assistant looks for the most loss-making position among all positions in the terminal. 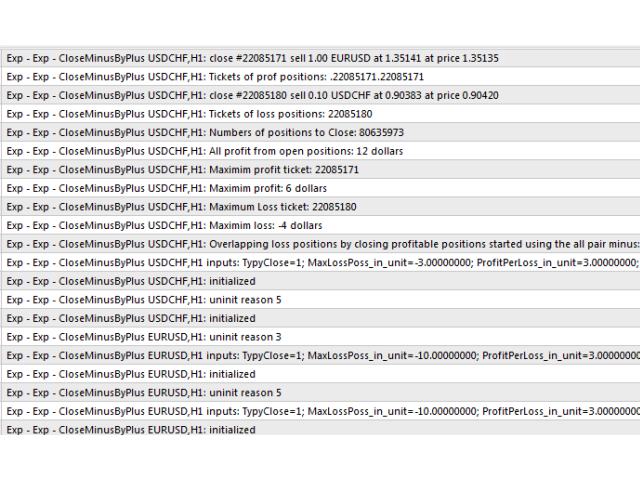 Further, by searching for other positions, it calculates a series of orders that can cover the loss and closes them. The series of orders can include any position. The maximum number of positions is specified in the settings of the Expert Advisor. TypeOfUnitToClose - type of profit and loss calculations. In USD or in points. MinLossInUnit - the minimum loss of a position in units (TypeOfUnitToClose), to be taken into account by the EA. An order with a loss of "MinLossPoss_in_unit" units (USD or points), should be placed in the negative zone. It is the upper limit when searching for unprofitable positions. For example: MinLossInUnit = -100, TypeOfUnitToClose = USD. Then the EA looks for or waits for a position with a loss greater than or equal to -100 USD, for example: -100 USD, -150 USD, -200 USD and so on. A position with a loss of -99 USD is ignored. AdditionalProfitInUnit - the amount of profit units for the difference to close a set of positions. Position (or several) with the total profit exceeding the loss by "AdditionalProfitInUnit" units. For example: AdditionalProfitInUnit= 10, MinLossInUnit= -100, TypeOfUnitToClose = USD. The EA will look for or wait for at least 2 positions, where one position has a loss of -100 USD and the other has a profit of +110 USD. At this point, the EA decides if it is necessary to activate its functions. MaxPos_in_Class - the "MaxPos_in_Class" parameter should limit the number of positions of the entire closing "set". For example: MaxPos_in_Class = 3, then the EA will look for a closing set with 3 positions at most (1 unprofitable and 2 profitable ones). FirstSymbolClose - search for position pairs and close only those in the currency of the currently processed losing position. You can disable the FirstSymbolClose, parameter. 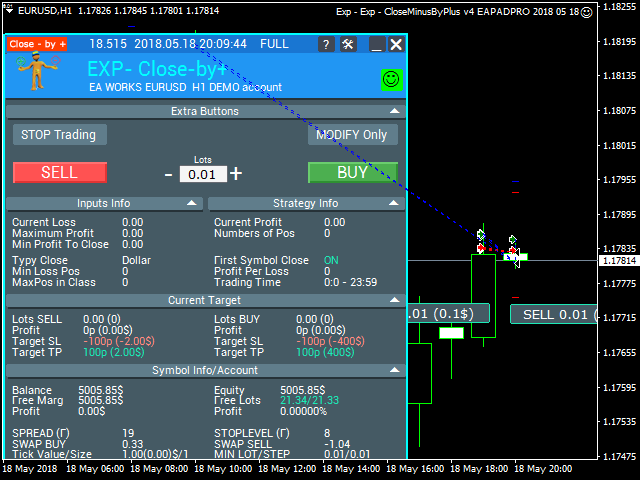 Then the EA will close any sets of losing and profitable positions on the entire account, regardless of the currency pair included in calculation. When the FirstSymbolClose function is enabled, the EA considers and closes sets of the same currency pair. MagiсToClose - magic number of positions: -1 = any, or you can specify a unique magic number of your positions to be processed. The operation involves attaching the Expert Advisor to a separate chart, making the necessary settings and continuing to work in our terminal. When the programmed condition triggers, the Expert Advisor comes into play and starts making calculations. This is a great EA to add to my setup. I would give it five stars if there were some setfiles for different scenarios. It would make things easier and a great way to understand how it works. I use many products from Vladislav, the utilities are exceptional even if they require a bit of patience to find the right settings based on their use. Each reviewed utility is used in my real account. Vladislav is a kind and helpful person for any help required. Great Vladislav !! я так понял главное правильно настроить. И в принципе из 10 пар закрывает пачку ордеров плюс минус. MinLossPoss_in_unit - should be set in the negative zone. This is the upper limit when searching for unprofitable positions. MinLossPoss_in_unit = parameter that limits the EA operation if the negative trade is greater than the MinLossPoss_in_unit. For example, when opening a trade, it profit = -spread. Added the message to the strategy tester stating that the product cannot be tested in the strategy tester. Added: disabling algorithm if there are more than 1 positive trade. The algorithm works if there are 2 or more positions to be closed. - Compiled under new build. - Added enumerations to select calculation and close type. Added array release before every pass to avoid closing positions with the same tickets.